Lilies come in such a wide variety of flower shapes and colors that this plant makes a welcome addition to any flower garden. 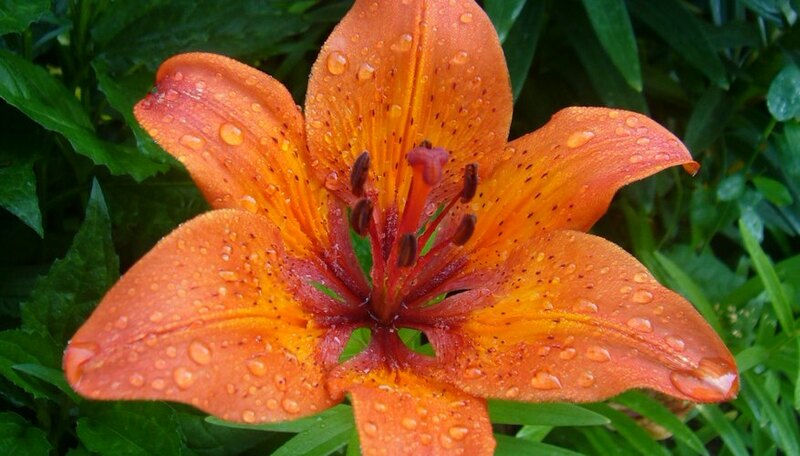 Tiger lilies bloom in bright orange and yellow flowers with distinctive darker markings on the petals. Traditional white Easter lilies add a simple graceful flowering option to your landscape. All lilies work extremely well as cut flowers in vases. Lilies are a bulb plant requiring minimal care. These plants will propagate and spread easily with proper care and maintenance. Prepare your garden soil with a good mixture of soil conditioner such as compost or an organic additive such as peat moss. Soil conditioners add nutrients to the soil and improve drainage. Don’t plant lilies in an area with pooling water since this will rot the bulbs. Dig holes relative to the size of the lily bulb using a trowel. Holes should be 2 to 4 inches deep for small bulbs and 4 to 6 inches deep for larger bulbs. Lilies like company so plant bulbs in groups of three to five bulbs per hole, spaced about a foot apart. Determine correct depth by placing the bulb in the hole and measuring depth from the bulb crown (top). Fill in with soil and press firmly to stabilize the soil. Water the plants thoroughly until the soil is damp but not soaking wet. Water the bulbs regularly during the growing season to encourage rigorous root growth. Add a light fertilizer to the soil around the plants after shoots emerge and during flowering. Use extreme care when dealing with new lily shoots since any damage to a shoot will prevent flowering. Consider transplanting some of the lily bulbs when the area becomes crowded or when flowering diminishes over time. Sometimes simply digging the bulbs up and reconditioning the soil will increase flowering. Divide lily bulbs by gently separating with your fingers. You shouldn't need to cut these bulbs to transplant. Bulbs should be planted soon after removal from the ground to prevent drying out. Allow stems and leaves to fall off when winter approaches. Apply a 4-inch layer of light mulch or organic material such as shredded leaves or straw to the plants in early winter. Mulching during this time allows the soil to retain an even temperature to stimulate root growth. Scrape away this mulch in the spring to allow new shoots the freedom to grow.